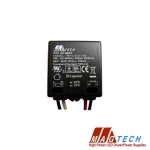 You will need a constant current LED driver to regulate current between your power supply and high-power LED. The LED driver will convert your power supply to constant current with a varying voltage suitable for LED lights, while not allowing the current to exceed the maximum current rating of the LED. This will protect your LED and make sure it is getting the power it needs. Our large driver selection contains constant current drivers with a wide range of outputs as well as drivers and components for dimming and non-dimming applications. 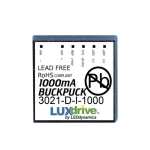 We offer LED drivers from top brands like: Phihong, Recom, Mean Well, MagTech, and LUXdrive. For more on understanding LED drivers see below. Using an LED driver is crucial in preventing damage to your LED(s). The forward voltage of LEDs change with their temperature; as temperature increases, forward voltage decreases, causing the LED to draw more current. The diode will continue to get hotter and draw more current until it burns itself out, this process is called 'Thermal Runaway'. Using a constant current LED driver prevents thermal runaway by compensating for the changes in forward voltage while regulating and delivering a constant current to the LED(s). Our selection of LED drivers can generally be broken into two different categories: either AC or DC Input. AC input or 'off-line' drivers take 110Vac – 277Vac, while DC input drivers most often accept between 3Vdc – 32Vdc. In most cases using a driver with low voltage DC input is recommended. Even if your input is high voltage AC power, lower voltage DC drivers are ideal as they are very efficient and reliable. They also have more options as far as dimming and output current go. Keep in mind that using a low voltage input driver with high voltage AC input does require an additional switching power supply. All our LED drivers deliver a constant current output, but it is up to you to understand the LED specs and choose the correct level of current output for the respective LED. Common output currents for our drivers are: 350mA, 500mA, 700mA, 1000mA, 1400mA and 2100mA. 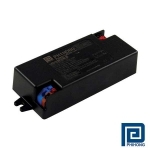 On all our LED pages you will find minimum and maximum drive currents. 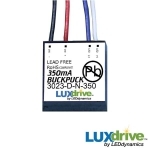 This makes it easy to select a driver with a safe output for the LED you choose. Both AC and DC input LED drivers can have dimming options with 0-10V being the most common. DC input drivers tend to provide more linear dimming, have less issues with flicker and provide a wider variety of options. However, we are seeing great results with the new ELV dimming AC input Magtech drivers. 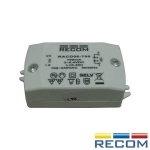 These drivers work with trailing edge ELV dimmers that do not require an external 10Vdc source. When choosing the right LED driver you first need to know what you are looking for. It is like finding the right tool for the job, you need to know what you are working with and what you need in a tool (driver). There are always many considerations and questions, like: How many LEDs can I run? And, What do I need for Power? To help make the LED driver selection process easier we published a comprehensive guide to: Understanding LED Drivers and How to Choose the Right One. Do I need to use an LED driver? What does an LED driver do? LED drivers differ from standard power-supplies by delivering a fixed current instead of a fixed voltage. The output voltage from a constant current LED driver will vary as required to maintain the desired output current. The forward voltage drop of LED junctions change with temperature, making a constant current driver necessary. Without a constant current source the risk of thermal runaway and total failure is likely. The most efficient way to power an LED driver is with a low voltage direct current (DC) source. 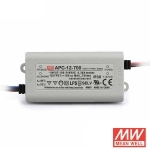 A switching power-supply (desktop) or a battery source are ideal, however if your application doesn't allow, we also offer Off-Line constant current LED drivers (120VAC Input). You want to run 3 Cree XP-G2 LEDs in-series at 1400mA from a low voltage DC source. 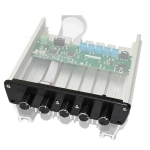 The LUXdrive A009-D-V-14000 BuckBlock driver will accept between 10Vdc-32Vdc and outputs 1400mA. To provided enough power, the input voltage to the driver must me greater than the forward voltage drop of the 3 LEDs in-series. A Cree XP-G2 LED at 1400mA has a forward voltage of 3.1Vdc, and 3.1 X 3 LEDs = 9.3Vdc. 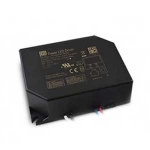 A common battery and power-supply size is 12Vdc, which would be a perfect choice. The final check is to make sure your power-supply can support the wattage. Equation: Watts=Amps X Vdc. In this case 1.4A times 9.3Vdc = 13.02 Watts.